Tuscany (Italian: Toscana) is a region in west-central Italy on the shores of the Ligurian and Tyrrhenian Seas. It has an area of 22,990 square kilometers (8,880 sq mi) and a population of about 3.6 million inhabitants. The regional capital is Florence. The area's history dates to the late second millennium B.C.E. and the Apennine culture (1350–1150 B.C.E.) and the following Villanovan culture (1100–700 B.C.E.) which saw Tuscany, and the rest of Etruria, taken over by chiefdoms. Tuscany's name comes from its pre-Roman inhabitants, the Etruscans. The region was ruled by Rome for several centuries and later became the site of numerous invasions during the Middle Ages. 2.1 Apennine and Villanovan cultures. Six different Tuscan localities have been designated by UNESCO as World Heritage Sites: the historical center of Florence (1982), the historical center of Siena (1995), the square of the Cathedral of Pisa (1987), the historical center of San Gimignano (1990), the historical center of Pienza (1996) and the Val d'Orcia (2004). Tuscany is known as the birthplace of the Italian Renaissance, and is best known for its cultural achievements in the areas of literature, art, and architecture. Tuscany is known worldwide for its scenery and its artistic legacy. 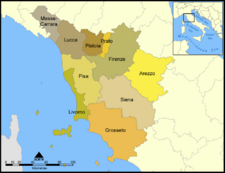 Tuscany is divided into ten provinces; Arezzo, Florence or Firenze, Grosseto, Livorno, Lucca, Massa-Carrara, Pisa, Pistoia, Prato, and Siena. Tuscany is a region of west-central Italy, near the base of the peninsula. Its area encompasses 22,992 square kilometers (8,877 sq mi). It borders Emilia-Romagna to the north, Liguria to the northwest, Tyrrhenian Sea to the west, Umbria and Marche to the east, Lazio to the southeast. The territory is two-thirds hilly and one-fourth mountainous. The remainder is constituted of the plains that form the valley of the Arno River. The Tuscan Archipelago is a chain of islands between the Ligurian Sea and Tyrrhenian Sea, west of administratively belonging to Tuscany. The archipelago contains the islands of Elba, Pianosa, Capraia, Montecristo, Giglio, Gorgona and Giannutri, all of which are protected as part of the Tuscan Archipelago National Park. The islands' proximity to several major cities has made them a favorite tourist location. Mount Capanne, the highest peak on the island of Elba. Elba is the largest island of the archipelago, and the third largest island in Italy after Sicily and Sardinia. The French island of Corsica lies about 50 kilometers (30 mi) to the west. Following the Treaty of Fontainebleau, French emperor Napoleon was exiled to Elba after his forced abdication in 1814 and arrived at Portoferraio on May 3, 1814 to begin his exile there. It is for the connection with Napoleon that Elba is best known internationally. The Tuscan-Emilian Apennines and the Apuan Alps border its north and northeast, with a long series of valleys from the sub-Apennine hills of Mount Albano, Mount Pratomagno, and others. 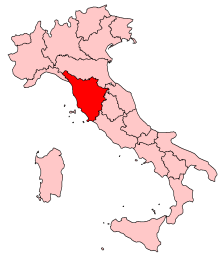 South of the Siena district are less fertile mountains and plateaus, such as the Metallifere Mountains, Mount Amiata, and Mount Argentario on the coast. Its lowland area consists of interior valleys or coastal plains. Tuscany is one of Italy's most prosperous agricultural regions. 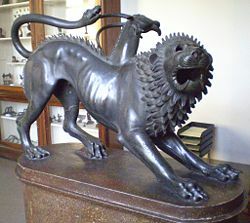 The Chimera of Arezzo, Etruscan bronze, 400 B.C.E. The Florence Cathedral in the evening sun. The pre-Etruscan history of the area in the late Bronze and Iron Ages parallels that of the early Greeks. The Tuscan area was inhabited by peoples of the so-called Apennine culture in the late second millennium B.C.E. (roughly 1350–1150 B.C.E.) who had trading relationships with the Minoan and Mycenaean civilizations in the Aegean Sea region. Following this, the Villanovan culture (1100–700 B.C.E.) came about which saw Tuscany, and the rest of Etruria, taken over by chiefdoms (as was also the case at this time in France and the Aegean after the collapse of Mycenae and Troy). City-states developed in the late Villanovan (again paralleling Greece and the Aegean) before "Orientalization" occurred and the Etruscan civilization rose. The Etruscans were the first major civilization in this region of Italy; large enough to lay down a transport infrastructure, implement agriculture and mining, and produce vivid art. The people who formed the civilization lived in the area (called Etruria) well into prehistory. The civilization grew to fill the area between the rivers Arno and Tiber from the eighth century, reaching their peak during the seventh and sixth centuries B.C.E., and finally ceded all power and territory to the Romans by the first century. Throughout their existence, the Etruscans lost territory to the surrounding civilizations of Magna Graecia, Carthage and Gaul. Despite being described as distinct in its manners and customs by contemporary Greeks, the cultures of Greece, and later Rome, influenced the civilization to a great extent. One of the reasons for its eventual demise is often attributed to this increasing lack of cultural distinction, including the adoption of the Etruscan upper class by the Romans. Soon after absorbing Etruria, Rome established the cities of Lucca, Pisa, Siena, and Florence, endowed the area with new technologies and development, and ensured peace.These developments included extensions of existing roads, introduction of aqueducts and sewers, and the construction of many buildings, both public and private. The Roman civilization in the West finally collapsed in the fifth century and the region was left by the Goths, and others. In the sixth century, the Longobards arrived and designated Lucca the capital of their Duchy of Tuscia. With pilgrims traveling along the Via Francigena between Rome and France came wealth and development during the Medieval period. The food and shelter needed by these travelers fueled the growth of new communities, especially near churches and taverns. The conflict between the Guelphs and Ghibellines, factions supporting, respectively, the Papacy and the Holy Roman Empire in central and northern Italy during the twelfth and thirteenth centuries, split the Tuscan people. These two factors gave rise to several powerful and rich communes in Tuscany: Arezzo, Florence, Lucca, Pisa, and Siena. The balance between these communes were ensured by the assets they held; Pisa, a port; Siena, banking; and Lucca, banking and silk. By the renaissance, however, Florence succeeded in becoming the cultural capital of Tuscany. 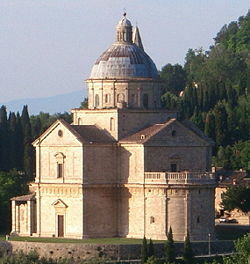 Madonna di San Biagio Church (built 1518 - 1545), near the walled town of Montepulciano, is considered to be Antonio da Sangallo the Elder's masterpiece and one of the most significant structures of the Renaissance. The Italian Renaissance began in Tuscany, centered in the cities of Florence and Siena. It later had a significant impact in Venice, where the remains of ancient Greek culture provided humanist scholars with new texts. Its artistic heritage includes architecture, painting and sculpture, collected in dozens of museums in towns and cities across the region. Perhaps the best-known are the Uffizi, the Accademia and the Bargello in Florence. Tuscany was the birthplace of Dante Alighieri ("the father of the Italian language"), Leonardo da Vinci, Michelangelo and Botticelli. In the leading city of Florence, the republic was from 1434 onward dominated by the increasingly monarchical Medici family. Initially, under Cosimo, Piero the Gouty, Lorenzo and Piero the Unfortunate, the forms of the republic were retained and the Medici ruled without a title, usually without even a formal office. These rulers presided over the Florentine Renaissance. There was a return to the republic from 1494 to 1512, when first Girolamo Savonarola then Piero Soderini oversaw the state. Cardinal Giovanni de' Medici retook the city with Spanish forces in 1512, before going to Rome to become Pope Leo X. Florence was dominated by a series of papal proxies until 1527 when the citizens declared the republic again, only to have it taken from them again in 1530 after a siege by an Imperial and Spanish army. At this point Pope Clement VII and Charles V appointed Alessandro de' Medici as the first formally hereditary ruler. For most of the 16th century the Medici family ruled Florence and Tuscany quite successfully, expanding the state's territory greatly by acquiring Siena. The Medici were patrons of science and the arts which flowered for much of their reign. Tuscany became a more cohesive and unified state during these years, rather than simply the dominion of a dominating city, Florence. As time went on, Tuscany was transformed in a number of ways, not always positively. Most importantly, the economy underwent a fundamental change in character. The wool industry was decimated during these later years, though the silk industry was, to some extent, able to replace it. Nonetheless, industry, which had shaped and sustained Florence since the Middle Ages began to decline throughout the seventeenth century. Investment in business became less lucrative and there was some “re-feudalization” of the Tuscan state with many patricians investing in land instead of industry. Tuscany is generally agreed to have declined greatly by the early eighteenth century under a series of inept grand dukes. The Medici ruled via a line of eight dukes over a period of nearly two hundred years. When the final, Gian Gastone, died without heirs in 1737, the grand duchy was inherited by the House of Lorraine; the Habsburg-Lorraine rulers with extensive Austrian domains. There were three Habsburg-Lorraine rulers; Francis of Lorraine, his son Leopold I of Lorraine, and Ferdinand III. They ruled from 1737 to 1801 collectively. The house Napoleon lived in while in exile in Portoferraio, Elba island. The second of these rulers, Leopold I (known in Italy as Pietro Leopoldino) was the only progressive reformer to rule Tuscany. He abolished the last vestiges of serfdom, encouraged trade and industry, and reformed the bureaucracy. During his long reign Tuscany became one of the most prosperous states in Italy. On November 30, 1786, he promulgated a penal reform making Tuscany the first sovereign state to abolish the death penalty. In this time period Tuscany was also known as a "Guild." Ferdinand III was deposed by Napoleon Bonaparte in 1801 and Tuscany was given to the Bourbon Dukes of Parma as compensation for the loss of their duchy. During this brief period, the Grand Duchy of Tuscany was known as the Kingdom of Etruria. Tuscany/Etruria was annexed by Napoleonic France in 1807. In 1809 Napoleon gave his sister Elisa the honorary title of Grand Duchess of Tuscany. With the Italian Wars of Independence in the 1850s, Tuscany was transferred from Austria to the newly unified nation of Italy. Tuscany is known for its wines (most famous of which are Chianti, Brunello di Montalcino, and Vino Nobile di Montepulciano). The region also specializes in olives and olive oil. Additional agricultural products include cereals (especially wheat), fruits including cherries, pears and lemons and vegetables are also grown, and cattle, horses, pigs, and poultry are raised extensively. Tuscany's Chianina cattle gave rise to the famous "Fiorentina" steak. Mineral resources include iron ore, which is easily worked from the offshore island of Elba, though it is nearing exhaustion. Still produced are lead, zinc, antimony, mercury, copper, and iron pyrites. Lignite, also known as brown coal, is mined around San Giovanni Valdarno, and Carrara's marble is world famous. Industries include metallurgy, steel factories, chemicals and petrochemicals, and textiles. Florence' artisan industries are known worldwide. The region also produces Piaggio cars, motorcycles, scooters and aeroplanes. Livorno, the major port, has shipbuilding industries. 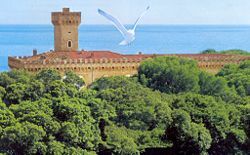 Tourism is important at the coastal resorts and the islands, especially Elba. It is the economic backbone of the so-called "Cities of Art": Florence, Lucca, Pisa, Siena, San Gimignano, Cortona, Pienza. The recent trend of agri-tourismo allows tourists to rent their vacation accommodations in castles, villas, bed-and-breakfast, apartments and on working farms and vinyards, surrounded by the rural life they come to experience. View of Castiglioncello. An artistic movement of the nineteenth century, Macchiaioli, chose this village because of its beauty, as an inspirational source for their work. In the 1980s and 1990s the region attracted an intense influx of immigrants, in particular from China and Northern Africa. There is also a significant community of British and Americans. In 2006, the Italian National Institute of Statistics (ISTAT) estimated nearly 215,500 foreign-born immigrants lived in Tuscany, equal to 5.9 percent of the total regional population. 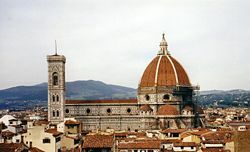 While Tuscany has a number of cities and towns with populations exceeding more than 50,000—Florence, Prato, Livorno, Arezzo, Pisa, Pistoia, Lucca, Grosseto, Massa, Carrara, Viareggio, Siena, Scandicci—and known for their beautiful architecture and history, it is equally well known for the beauty of its rural countryside and its quaint villages. Tuscany was the birthplace of the Macchiaioli arts movement. The Macchiaioli were forerunners of the Impressionists who, beginning in the 1860s, would pursue similar aims in France. The most notable artists of this movement were Giuseppe Abbati, Odoardo Borrani, Vincenzo Cabianca, Vito D'Ancona, Giovanni Fattori, Silvestro Lega and Telemaco Signorini. The movement grew from a small group of artists, many of whom had been revolutionaries in the uprisings of 1848. The artists met at the Caffè Michelangiolo in Florence throughout the 1850s to discuss art and politics. These idealistic young men, dissatisfied with the art of the academies, shared a wish to reinvigorate Italian art by emulating the bold tonal structure they admired in such old masters as Rembrandt, Caravaggio and Tintoretto. Today the work of the Macchiaioli is much better known in Italy than elsewhere; much of the work is held, outside the public record, in private collections throughout the country. ↑ 1.0 1.1 Graeme Barker and Tom Rasmussen. 2000. The Etruscans. (Oxford: Blackwell Publishers. ISBN 0631220380) Online version.books.google. Retrieved November 14, 2008. ↑ 2.0 2.1 2.2 Emma Jones. 2005. Adventure guide. Tuscany & Umbria. (Edison, NJ: Hunter. ISBN 1588435474) Online version.books.google. Retrieved November 14, 2008. Barker, Graeme, and Tom Rasmussen. 2000. The Etruscans. (The peoples of Europe.) Oxford: Blackwell Publishers. ISBN 0631220380 Online version Retrieved November 14, 2008. Jones, Emma. 2005. Adventure guide. Tuscany & Umbria. (Hunter travel guides.) Edison, NJ: Hunter. ISBN 1588435474 Online version Retrieved November 14, 2008. Price, Rick. Tuscany: An Introduction to the History and Geography Experience Plus. Retrieved November 14, 2008. All links retrieved December 24, 2015. This page was last modified on 24 December 2015, at 16:00.